Capacitance-based liquid level sensors, used in conjunction with Models 175, 1700, and 286 cryogen monitors and controllers, are typically manufactured of 3/8 inch OD stainless steel tubing and will operate with virtually all common laboratory cryogenic liquids including nitrogen, liquid neon, and liquid xenon. Sensors for common Industrial Use Cryogenics are also available for materials such as liquid oxygen (LOx), liquid hydrogen LH2), liquid carbon dioxide (liquid CO2), liquified or liquefied natural gas (LNG), liquid argon, liquid propane, and liquid butane. Upon request, special assembly techniques can be applied for sensors required for liquid oxygen or hydrogen measurement. Sensors can be supplied in single-section overall lengths of up to 50 feet. Alternatively segmented sensors are available that can be bolted together during installation. Three standard sensor mounting configurations are available. 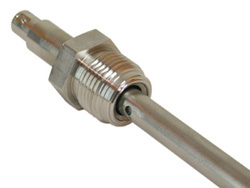 The typical configuration includes a hermetically sealed BNC connector with an adjustable 3/8 NPT nylon feed-through. For higher pressure or vacuum applications, a welded stainless steel 3/8 NPT BNC connector fitting or conflat flange BNC connector fitting, respectively, is available. A connecting coaxial cable and in-line oscillator/transmitter are required to interface the sensor to the non-industrial instrument. See also Custom Liquid Level Sensors. AMI can provide a number of specialty sensors depending upon the application requirements. In industrial environments AMI recommends the use of our 1/2" O.D. Rugged Service sensors. These sensors are built to a more robust standard to survive rough handling. These sensors are also recommended in applications were a metal compression fitting is used to prevent crimping of the metal outer tube. The Model 175 Industrial Cryogenic Level Transmitter is constructed using a fully weather-proof, corrosion-resistant NEMA 4X enclosure. The transmitter and concentric tube (typical) capacitance sensor are designed for mounting the transmitter either integral with (atop) the sensor, or remotely. A sensor with welded VCR fitting is shown here on right.